_New Haven, a leading port in international and coastal trade, became a booming manufacturing center by the mid-1800s. _In a sense, New Haven is the birthplace of modern American industry; it was here that Eli Whitney, inventor of the cotton gin, developed new methods of manufacturing. Whitney had a factory in New Haven where muskets were mass-produced for the government. Southwest Ledge is a dangerous rock formation about a mile offshore on the east side of the main channel into New Haven Harbor. In 1845, Fifth Auditor and Superintendent of Lights Stephen Pleasanton had recommended the building of a lighthouse at Southwest Ledge to replace the old New Haven Light at Five Mile Point, but the isolated location made the light prohibitively expensive at that time. With improvements in lighthouse engineering, the construction of Southwest Ledge Light began in 1873. _The lighthouse was one of the first in the nation to be built on a cylindrical iron foundation. _The shape allowed floating ice to drift around it in winter rather than becoming trapped around the foundation. 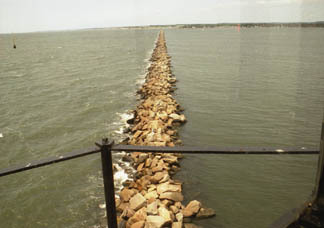 After rip-rap stones with a central opening were laid to prepare for the placement of a cylindrical foundation, a major winter storm caused work to be halted until the following spring. After the storm damage was repaired, an iron tube was put in place and filled with concrete. Before it was put in place at the ledge, the superstructure of the lighthouse intended for Southwest Ledge was on display at the Centennial Exposition in Philadelphia in 1876, with an actual lighthouse keeper maintaining a light in the tower during the exposition. _As it turned out, the structure displayed in Philadelphia was sent to Delaware where it became Ship John Shoal Light, and an identical tower was sent to Southwest Ledge. In the summer of 1876, the 45-foot cast-iron, wood-lined lighthouse tower was put in place, and Southwest Ledge Light became operational on January 1, 1877. 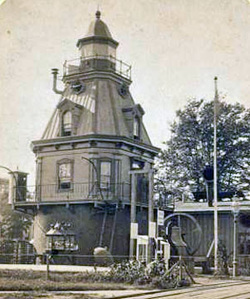 On the same day the old New Haven Light, or Five Mile Point Light, was extinguished. Not long after the lighthouse was built, it became the terminus for a new breakwall in New Haven Harbor. The architectural style of Southwest Ledge Light is unique. It is eight-sided, with Second Empire detailing and a mansard roof topped by an octagonal lantern. The interior contains three stories. The tower was painted red in 1880; it was later painted white. 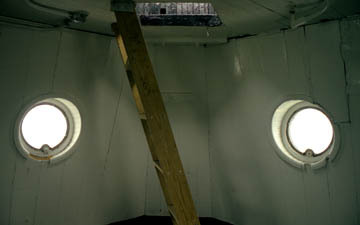 _The new lighthouse had a fourth-order Fresnel lens exhibiting a fixed white light, visible for 13 nautical miles. A Daboll fog signal was installed in 1888. In 1889 a red sector was added to the lantern to warn mariners approaching Branford Reef and Gangway Rock. The first keeper was Elizur Thompson, who had been keeper of the light at Five Mile Point. He complained of the poor living conditions in the new lighthouse, which was leaky and damp. Not much seems to have been done in response to his complaints except for some minor repairs. A hurricane in 1889 and other storms caused damage to the tower's cistern and foundation. Finally in 1911 the foundation was repaired and reinforced. The dampness of the interior remained a problem. In 1916 Keeper Edward Grime resigned because of the dampness problem, the lack of drinkable water, and the presence of numerous cockroaches. The isolation and poor conditions may have indirectly caused the death of one assistant keeper in 1908. Assistant Keeper Nils Nilson (sometimes spelled Nelson) became despondent and violent. On one occasion, Nilson, who was much larger than his superior, chased Keeper Jorgen Tonnesen around the lighthouse with a fire ax. The keeper saved himself by locking himself in a storage area, and Nilson left in a rowboat. Tonnesen brought his brother-in-law to the station for protection. Nilson returned and twice threatened to take his own life. The keeper's brother-in-law intervened, and Nilson again left for shore. Not long after this episode, in January 1908, Nils Nilson took his own life on shore. 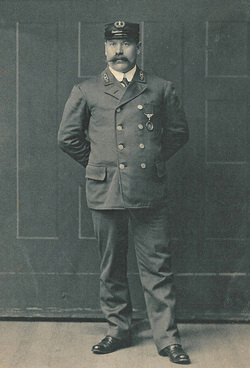 Before he came to Southwest Ledge, Nilson had been awarded a gold medal for lifesaving while he was assistant keeper at Sakonnet Point Lighthouse in Rhode Island. The four Coast Guard keepers were removed and Southwest Ledge Light became an automatic beacon on August 15, 1953. As part of the automation process, power was supplied by a cable from shore. After 1953, for some years the lighthouse was looked after by a "lamplighter" who lived on shore but did maintenance as needed. Some time in the 1950s to 1965, my grandfather, John Wood was in charge of operating the lighthouse. I remember as a child watching him as we drove out to the end of the road (Morgan Ave.?) and he would open a metal box and flip a switch - I assume turning the foghorn on. These are fuzzy memories, but I do know that after his death in 1965 my grandmother received a small pension every month from the U.S. Government for my grandfather's service. He also owned and operated Wood's Boat House, directly across Morris Creek from Lighthouse Point. The Fresnel lens was replaced by a modern FA-251 optic in 1988. In early 2001, some maintenance work was conducted on the lighthouse by the Coast Guard cutter Penobscot Bay out of Bayonne, New Jersey. 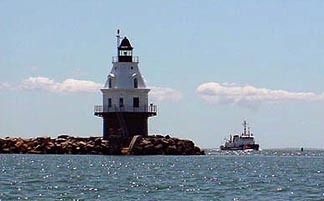 The lighthouse can be seen distantly from Lighthouse Point Park and from New Haven's Long Wharf, but it is best seen by private boat. The automated flashing red light and fog signal continue to serve as active aids to navigation. Under the guidelines of the National Historic Lighthouse Preservation Act of 2000, the lighthouse was sold for $180,002 in an online auction that ended on September 2, 2016. A group of donors joined forces to produce the winning bid. There are plans for Marine sciences students at Southern Connecticut State University to utilize the lighthouse, as well as students at Green Light Academy, a program of Beacon Preservation Inc. The Coast Guard cutter î is to the right of the lighthouse. U.S. Coast Guard photo. _Special thanks to Ed Skvorc for the exciting ride!